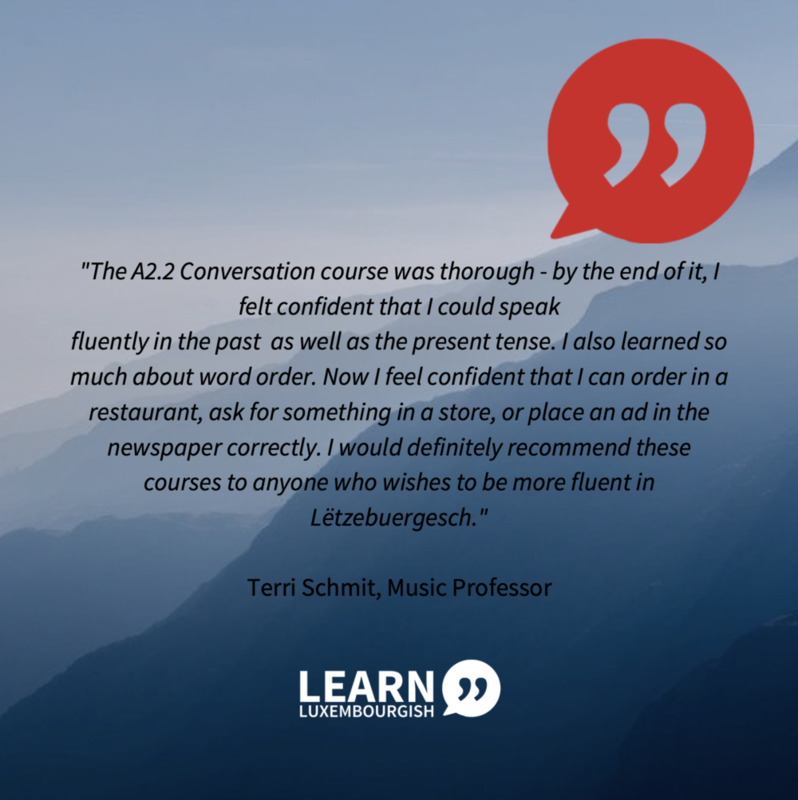 The A2.2 Conversation Skype class is certified by the Ministry of Education in Luxembourg and qualifies for the 24 hours of Luxembourgish lessons needed to receive the Luxembourgish nationality if you've lived in Luxembourg for at least 20 years. How do I know this class is for me: For people who have completed the A2.1 Conversation course, or finished A2.1 level courses in other language schools. The A2.2 level refers to one level up from the previous A2.1 level, according to the Common European Framework of Reference for Languages. Throughout this class you will expand the range and scope of what you are able to talk about in Luxembourgish while increasing your vocabulary and deepening your grammatical knowledge. How is the class taught: The class takes place online through Skype once a week for 12 weeks in a row. Each lesson is 60 minutes long. The class is mostly taught in Luxembourgish while the course material is in English. After each lesson you will have access to online notes that summarize the activities of that day’s class. What are the topics covered in the course: presenting yourself in a succinct fashion, leading conversations at the grocery store and at the airport, talking about your shopping and eating habits, inviting someone for dinner and responding to an invitation from someone else, presenting recipes, talking about your holidays and other events in the past, expressing likes and dislikes, talking about your free time as well as social and work life in Luxembourg, giving directions, talking about your extended family, learning about the media environment in Luxembourg and understanding short news articles. One grammar topic will also be reviewed together with the teacher during each lesson (word order, coordinating conjunctions, simple past tense, present perfect tense, personal and possessive pronouns, the impersonal pronoun “one”, the conditional tense, describing an action in progress and direct/indirect speech, among others). There is a 70€ non-refundable deposit on this A2.2 Conversation class in order to reserve your spot. Cancellations are accepted until immediately after the first lesson. Yes, I'd like to receive pricing information. Please tell us which day of the week and time of the day works best for your classes (and please specify your timezone).